PURPOSE Are you ready to give your body a fresh start, away from junk food and unhealthy habits? 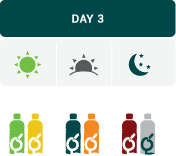 With our 3-Day Juice Cleanse , you will enjoy 6 juices daily for a period of 3 days to help break your body's dependence on unhealthy foods. As a result of those 18 unique juice blends, you will experience boosts in energy, decrease in cravings, and weight loss. Consume your bottles every 2 to 3 hours, or whenever you feel hungry. Avoid caffeine or alcohol during your juice days. Replace these with herbal drinks and green tea. Prepare your body to cleanse by eating healthily a few days ahead. • 1 cup of nut milk (or low-fat dairy). • 2-3 boiled egg whites. • Small bowl of steamed edamame. • Bowl of unprocessed vegetable soup. • Bowl of cooked oatmeal (prepared with a 250 ml cup of almond milk). • You may add a pinch of salt when needed, this will supplement the sodium balance during your cleanse. Reduce your physical activity during your cleanse. It is O.K. to be active, but slow down on the exercise.